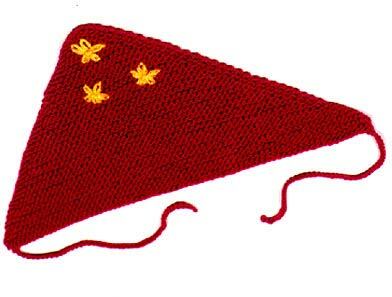 For summertime or anytime, this quick-to-knit kerchief is all the fashion rage. Make one to match every outfit and for more spice, embellish your finished kerchief with colorful embroidery. One size fits almost everyone from teens to adults. If you have a special fitting need, adjust the length of the straps. 5 stitches and 9 rows to 1". knit (k) stitches (sts) make one (M1). Note: A make one increase is done by inserting the left-hand needle between the stitch just worked and the new stitch on the needle, lift the bar strand of yarn onto the left needle and knit that strand working into the loop at the back of the needle. 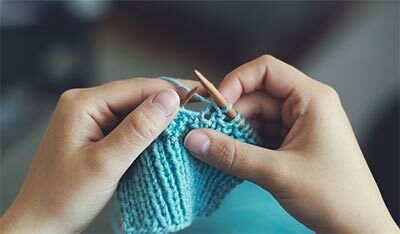 If you are a novice knitter, you can also increase by simply knitting into the front and back of the stitch just before the M1 command in the pattern. Cast on 3 sts (point). Row 2: K1, M1, k1, M1, k1. You now have 5 sts on the needle. Row 3: Knit. Row 4: K1, M1, knit to the last stitch, M1, k1. Repeat rows 3 and 4 until piece measures 9" deep, measuring from point to upper edge. You should have approximately 73 sts on needle. Knit 2 rows. 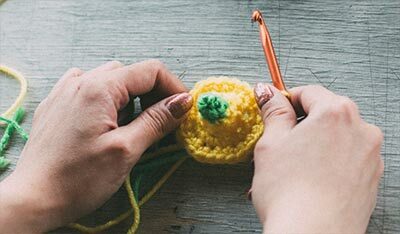 Using a crochet hook, attach yarn and follow instructions as for crocheted kerchief.